When evolutionary biologist W. Ford Doolittle was working through a few ideas for a recent series of papers, he found inspiration in an unlikely place: an old rock song from his youth. It wasn’t the reverb-laden jangle of the 1965 Rolling Stones tune “The Singer Not the Song” that spurred him on in his work, but its title. By simply rearranging a few words, he inverted the name’s meaning and came up with a compelling analogy he could use to support a theory he’d been working on. “I’m calling this the ‘It’s the Song, Not the Singer’ hypothesis,” he says. The argument, laid out in two major journal articles published in the past year, sees Dr. Doolittle turning his attention back to some of the bigger philosophical debates in contemporary evolutionary biology — something he has done to great effect throughout his career. This particular debate is about whether evolution and natural selection can be understood in terms of persistent, community-level metabolic processes, rather than the individual ephemeral entities (organisms and species) that carry them out. To many molecular biologists, it’s a radical idea — one that goes against much of the conventional wisdom in the field. And that’s exactly the point. 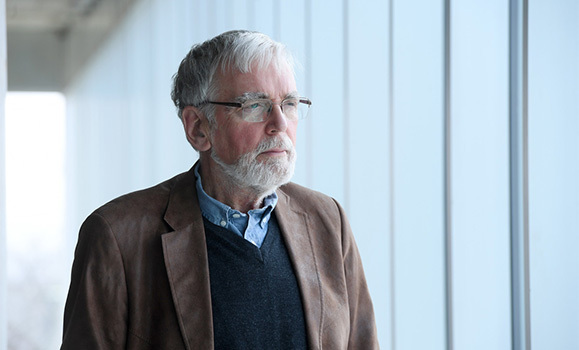 Dr. Doolittle’s 45-year career at Dalhousie has been defined by just this sort of disruptive, “what if” approach to science. While a lot of microbiologists do their most important work in front of a microscope, many of Dr. Doolittle’s biggest contributions to the field have grown out of the deep, often contrarian thinking he’s done in between visits to the lab. It’s an approach that has helped cement his status as one of the world’s top molecular biologists and a trailblazer working on the frontiers of evolutionary biology. And it’s also one of the many reasons he’s receiving the 2017 Killam Prize in the Natural Sciences from the Canada Council for the Arts. The $100,000 award, considered among the top research honours in the country, recognizes individuals who have dedicated their careers to pushing the boundaries of knowledge in the social sciences, humanities, health sciences, engineering, and natural sciences. It's the second year in a row that the Killam Prize in the Natural Sciences has gone to a Dalhousie researcher: last year, Chemistry's Axel Becke received the honour. Other past Dal recipients of a Killam Prize are Sue Sherwin (Philosophy) and Brian Hall (Biology). 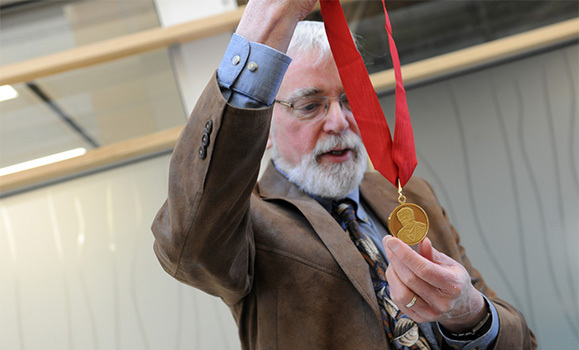 Dr. Doolittle with his Herzberg Medal in 2014. Dr. Doolittle’s Killam win comes just a few years after becoming Dal’s first-ever recipient of the Natural Sciences and Engineering Research Council of Canada’s $1-million Gerhard Herzberg Canada Gold Medal for Science and Engineering, the organization’s top research honour. Since then, two other Dal researchers (Dr. Becke and Physics’ Jeff Dahn) have also been awarded the Herzberg — a stellar run of three winners in four years. Dr. Doolittle began his career as a biochemist about a half a century ago when the field of molecular genetics was still fairly young. Many scientists were investigating questions such as “What is a gene?” and “How do genes work?” Today, many of those relatively basic questions have been answered, thanks in part to the work of Dr. Doolittle and other molecular scientists like him. But what happened along the way was a series of watershed discoveries with few comparisons in contemporary science. "The progress in molecular biology in in the last 50 years, in particular as this progress bears on evolution, has been one of the most astounding intellectual developments in the history of our species,” as Dr. Doolittle describes it. That may sound rather grandiose, but consider even a few of the convention-busting discoveries Dr. Doolittle himself has been responsible for and it becomes clear that humanity is much closer now to understanding the origins of life on Earth than it has ever been. One of Dr. Doolittle’s first major achievements after arriving at Dal in 1971 was in helping prove something called the “endosymbiont hypothesis,” a rather controversial idea at the time that claimed chloroplasts and mitochondria in plant cells both originated from bacteria that were once free living before they were engulfed by a nucleated host cell. A decade later, Dr. Doolittle riled many fellow molecular geneticists when he claimed that some DNA in cells was essentially “selfish” or parasitic, existing only to replicate itself rather than improve the fitness of its host. “Everybody wanted to believe, I think, that the extra DNA in cells was there for some kind of future directed purpose; that evolution can somehow plan for the future, which is nonsense,” he says. Dr. Doolittle is perhaps best known for his work questioning Charles Darwin’s ‘Tree of Life’ picture of evolution. Darwin’s 150-year old theory embraced the idea that all species can be positioned on a single figurative tree and its branches. But as scientists came to learn more about the behavior of lower-level life forms (such as bacteria, single-celled organisms and archaea) and about genetics — both little understood in Darwin’s time — it became clear that there was a lot of gene-swapping going on between species. The tree began to look a lot more like a web or network instead, argued Dr. Doolittle. In 1999, he published a paper in Science arguing that the rarely challenged Tree of Life metaphor failed to explain more than two-thirds of the four billion years of life on Earth. Some scientists were reluctant to let go of this understanding of Darwin’s theory, but by now the phenomenon of gene swapping among microbes is widely accepted and often used to help explain why some bacteria develop resistance to antibiotics or “learn” to metabolize environmental pollutants. Turns out, quite a lot. While a scientist by profession, Dr. Doolittle says his success in challenging the scientific community to rethink the inner workings of DNA and the evolution of the genome derives in part from his skills in using rhetoric to build an argument — something he credits to taking more humanities courses than science ones as an undergraduate at Harvard University. Dr. Doolittle's father was an art professor at the University of Illinois, and, growing up, he thought he might follow his father's path into the arts. (He later did so, in a sense, completing a BFA in Photography at NSCAD at the age of 72). Even when the younger Doolittle arrived at Harvard, he was still unsure of what he wanted to be: a scientist or an English professor. It took getting accepted into a special seminar program in biochemistry (and rejected from one in English) for him to truly become submerged in the world of science. And submerge himself he did, moving on to Stanford University for his PhD where he got to study alongside some of the pioneering figures in molecular biology of the day. Dr. Doolittle proved himself a skilled experimental biochemist in the lab and began to consider where his career might take him. "I've never regretted it. I'm really happy I came here and happy that it worked out," he says, noting that he liked being somewhat removed from the competitive atmosphere at the big-name schools where he studied. For all of his reputation as a contrarian, Dr. Doolittle says he has also done a lot of standard molecular biology throughout his career. It's just that he always gravitated toward experiments that would tell him something about evolution. 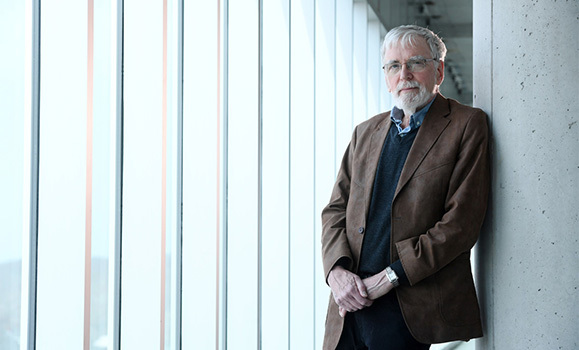 Following the success of his work in the 1970s and the early 1980s, the Canadian Institute for Advanced Research (CIAR) approached him about becoming the director of a new Evolutionary Biology program. He held that role from 1986 – 2007, serving as a mentor to dozens of young molecular and evolutionary biologists who have gone on to become stars in the field in their own right. Several of them remain at Dal in the Comparative Genomics and Evolutionary Bioinformatics (CGEB) group, which was set up in 2007 as a local wing of a new CIAR program (Integrated Microbial Biodiversity) run out of the University of British Columbia by Dr. Doolittle’s former grad student, Patrick Keeling. “I do think Canada is hitting ways above its weight in terms of early cell evolution and, basically, that’s because of these programs,” he says. With more than 300 publications and 25,000 citations, Dr. Doolittle’s impact in his field is indisputable. Now 75, Dr. Doolittle spends most of his time pondering questions at the border between science and philosophy. He stepped away from running a lab five years ago and all of his current post-docs are Philosophy PhDs, not microbiologists. Yet, somehow he seems more immersed in his field than ever. Seated in his office in Dal’s Tupper Building, he is surrounded by piles and piles of books and periodicals. But it’s a framed Photoshop image on the wall of Dr. Doolittle standing arm in arm with Charles Darwin that seems to sum up his career more than anything else. He says he created the image as a sort of self-deflating joke about his own importance, but also as a show of affection for Darwin, whom he likes to think would share some of the views of modern evolutionists such as himself if he were alive today. “It’s really hard to get your mind around the scope of evolution — especially the time it took,” he says. “Whenever I feel insufficiently spiritual, I just try to remind myself of what I believe, which is that this all started in some warm little pond with probably some RNA molecules and somehow they learned how to replicate themselves. And not so suddenly, four billion years later, we have Mozart and Einstein and all that stuff. Learn more about Dr. Doolittle's work and achievements, and hear from some of his colleagues, by following along on Twitter with the hashtag "#CongratsDoolittle"